I am finding that the recipe development process starts with some ingredient or combination of ingredients entering my subconscious and sitting with me for some time. Eventually the full recipe will evolve after batting around ideas that may or may not translate into something tasty. I had cherries and chocolate on the brain for a couple of weeks now. At some point fennel entered the picture, but I don’t recall when or why. I work across the street from the San Francisco Ferry Building which is fantastic place for seeking gastronomic inspiration. I purchased some dried, unsulphered, unsweetened cherries from Capay Organic, everything else I had in stock. I got ever so slightly experimental by soaking half the cherries in brandy overnight and left the other half alone. 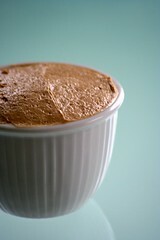 I took this recipe recently posted on Flickr by MarionQuaggatuggu. I divided the batter in half and folded in drained and chopped brandy-soaked cherries for an adult version and folded in chopped plain cherries and Valrhona chunks for a kid-friendly version. The result was more than I could hope for – rich, moist, dense, but flakey cake with a deep chocolate flavor and the occasional texture variation and kick from the brandy-soaked cherries. I preferred the brandy version personally. For the fennel cream cheese frosting, I decided to make a syrup to add to my standard cream cheese frosting recipe. I used just a couple tablespoons of sugar and water with a teaspoon of fennel that I crushed slightly with a mortar and pestle. I boiled the mixture down until it was very syrupy and added the whole thing to the frosting. The syrup was delicious and the frosting was fantastic. I loved the overall flavor combination of the cake and frosting and consider this a keeper. 1. Chop cherries and transfer to a small bowl. Cover in brandy and set aside to plump overnight. 4. 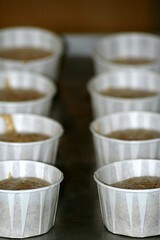 Add seeds to the sugar and let boil over medium-low heat for 3 to 5 minutes or until the mixture is syrupy. Set aside to cool. Note: I had a lot of frosting left over. Recommended uses include serving alongside sliced fruit (I had it with papaya and banana) or french toast. It can also be frozen for future use (use within a month or so). I store it in a freezer bag and when ready, transfer the bag to the refrigerator to thaw. 2. Decorate as you wish. 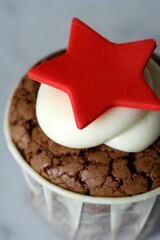 I topped the cupcakes with a pastillage star. I got this basic pastillage recipe from the internet. I was looking for something that didn’t have any special ingredients like gumtex or glucose. I wasn’t up for a ride to the cake supply store. I found this pastillage difficult to work with. I couldn’t get it very thin (I think partly because it was slightly sticky) and a lot of my shapes cracked when I went to remove them. The recipe makes plenty though, so I had enough shapes that worked out alright and still have two balls left over. 1. Stir gelatin into the water. Let stand 5 minutes, then heat until the gelatin is dissolved. 2. Sift together the sugar, starch, and cream of tartar. 3. Place the gelatin and the water mixture in a bowl. Add part of the sugar mixture and stir with a spoon until it is absorbed. Add food coloring and continue stirring. 4. Add remaining sugar in stages, stirring to combine. 5. 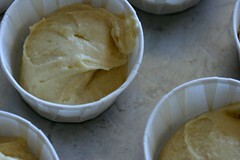 Hand knead mixture to a smooth, pliable paste. This stage takes a while, can be messy (I kept it in a large bowl), and may require some splashes of cool water to bring the mixture together. Add water slowly or the result may be too sticky. If that happens, add a bit more powdered sugar. 6. Divide paste into three balls. Wrap two of them very well with plastic wrap. Pastillage must be kept covered as it dries quickly. 7. Roll out one ball at a time, using cornstarch to prevent sticking. Cut out shapes with cookies cutters or whatever you have. Dried them on parchment. Delicate designs will likely crack when you go to remove them from the parchment. The simpler, the better. Q. 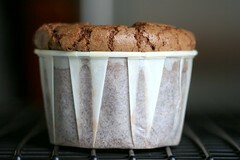 Where can I find those neat baking cups you use? A. I have purchased them from here, where they are inexpensive, but the shipping is high. I also found this site that has them, they refer to them as ‘Nut & Party’ cups. Q. Where do you get your food coloring? Can I use regular, grocery store food coloring if I can’t find the gel food coloring? A. The gel food coloring is thicker and more potent, so you need less to get the same effect as with the more liquidy stuff you find in the grocery store. This is mostly important with frostings as the liquid food coloring can mess with the consistency especially if you are trying to get a very vibrant color. Gel is better for this purpose. When adding food coloring to batter, it’s less of an issue. However, if you are adding a lot of coloring, adjust the amount of liquid in the recipe. For example, if you add a tablespoon of liquid food coloring to a red velvet recipe, cut back on a tablespoon of the buttermilk. I get my gel food coloring at a local cake supply store, Sugar N Spice. I use Americolor brand and there are plenty of online shops that sell it. Here is just one, Kerekes. Q. How do you get those cool swirls on your cupcakes? My tips seem too small which ones are you using? Q. Can I make these regular cupcakes mini sized or the mini cupcakes regular sized? A. Almost all the recipes I have will work in either size. The important thing to note is the baking time. 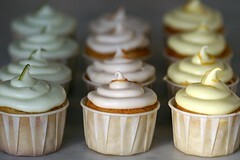 On average, mini cupcakes take 12-15 minutes to bake and regular cupcakes take 22-25 minutes to bake. Q. How long to jumbo cupcakes take to bake? Where can I get jumbo cupcake papers? A. I normally don’t bake ‘jumbo’ cupcakes. I am a firm believer that cupcakes should look cute and they are cuter the smaller they are. Q. Do cupcakes need to be refrigerated? Can they be frozen? How are they best stored? A. I find that room temperature; air-tight storage retains the most flavor, texture, and moisture. However there are some frostings and fillings that I believe should be refrigerated if cupcakes are stored for more than a few hours – mostly for safety reasons. So, if you are storing cupcakes overnight and they are frosted with cream cheese or filled with whipped cream, then store them in tupperware, in a cake box wrapped in plastic wrap, or in a cupcake container wrapped in plastic wrap. I have frozen unfrosted cupcakes before when I simply had too much to do too close to an event and needed to get the cupcakes baked off the weekend before. I have had success with cakes, but ultimately I believe that freezing detracts from the texture and flavor of the cupcake. So, I try to not do it. If you must, double wrap unfrosted cupcakes and place in an airtight container or freezer bag and freeze but for not more than a week. 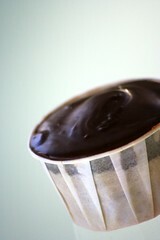 To defrost, place the wrapped cupcakes and let defrost wrapped for 6-8 hours, and then unwrap. Q. How much does a stick of butter weigh? A. 110 grams give or take a few. Here is a good resource for weights of a cup of various ingredients. Disclaimer: I am not a professional baker or pastry chef. I have, however, been baking fairly consistently since I was 13. I have taken a week long pastry class at Culinary Institute of America at Greystone (which was awesome, by the way) and some consumer classes at the California Culinary Academy. I went to school for chemical engineering, but am now a software quality engineer. The schooling influences my approach to baking (methodical) and the software experience helped with adding a third column to the blogger template (why no three-column templates, blogger?). 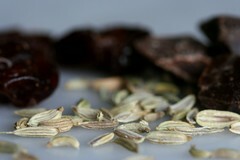 The whole digital food photography thing is a new world for me and I am enjoying the challenge immensely. To sum it up – I speak from experience only. I try not to answer questions that I don’t have answers for, but will do some googling and forward references to folks if I haven’t figured out the problem in the past. I don’t know about you, but I ate lots of chocolate over the holidays. 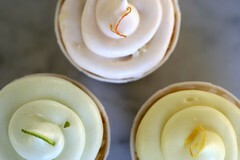 I felt like a break and decided to make a trio of citrus curds to stuff into some basic vanilla cupcakes. I topped them with a simple cream cheese frosting and a little zest for decoration. Simple, fresh, and delicious. I used some existing recipes this time around… Magnolia’s Traditional Vanilla Birthday Cake recipe (adjusted to use all-purpose flour only) and Martha Stewart’s lemon curd recipe. I have used both of these, on numerous occasions, with great results. I have reprinted them as I have altered them slightly and I provide some tips along the way. 4. Whisk together flour, baking powder, and baking soda in a bowl. 9. 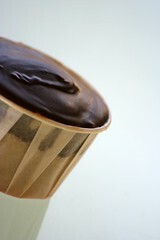 Scoop into cupcake papers about half to three-quarters full (depending on whether you want flat or domed cupcakes). Tip: It is important that the butter is at room temperature and beat well. Otherwise you might get butter chunks which sort of melt into little pools and make the cupcakes come out funny-looking. Not a huge deal, but I thought I’d mention it. 1. Whisk together egg yolks, sugar, and citrus juice in a small, heavy-bottomed saucepan. Cook over low heat, stirring constantly, until mixture coats the back of a spoon, about 4 minutes. 3. Whip together cream and powdered sugar until stiff peaks form. 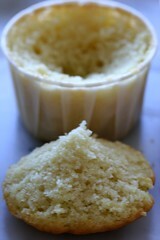 Tip: The above recipe makes enough curd for over a teaspoon of filling for 24 cupcakes. I made 6 egg yolks worth so that I could get three batches for the three flavors. I ended up with extra, but those who wandered into the kitchen didn’t mind having something to dip the cupcake guts into. 2. Fill the cavity with a teaspoon or so of curd. 5. Decorate as you wish. I topped the cupcakes with zest.